Smart industry means increased efficiency and the emergence of new customer values. The digital development that makes smart industry possible is what we call IndTech in this report. 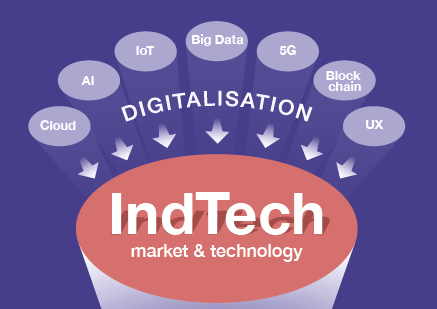 IndTech represents all the opportunities rapidly spreading within industrial value systems. But it is also about a change with its background in the computerisation of industry in the 1980s and 1990s. A tangible legacy we have inherited as a large technology base, often with a long remaining lifespan. The IndTech concept therefore indicates a development in which industry’s demand for digitisation solutions needs to take past investments and experiences into account. This is where industry differs from volatile consumer markets. It also places particular demands on IndTech suppliers. Just any old “app” is not sufficient in order to meet industry’s exacting requirements. Such an app has to represent process knowledge, industrial security and accessibility requirements, whilst simultaneously being as simple and neat as we are used to apps being. This report will primarily cover technology providers, their markets and technological developments. Please read the report here.